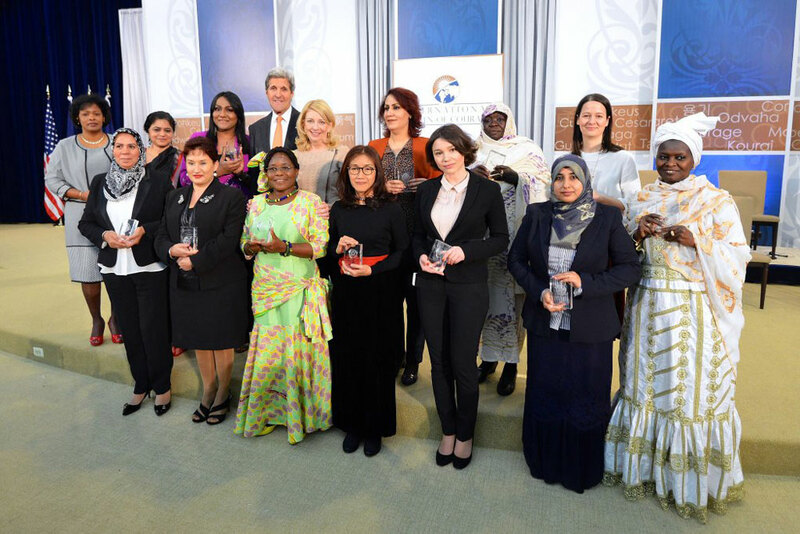 Zhanna Nemtsova (3rd right) among 14 recipients of the State Department’s International Women of Courage Award. Founder of organization honoring her father one of 14 honorees. Zhanna Nemtsova, the eldest daughter of slain opposition leader Boris Nemtsov, was honored by U.S. Secretary of State John Kerry for championing “democracy, education and freedom of information” in Russia. Nemtsova was among 14 recipients of the State Department’s International Women of Courage Award presented by Kerry at the March 29th ceremony in Washington, D.C.
“Fourteen leaders, 14 role models, 14 women of courage, one crystal clear message,” Kerry said at the opening ceremony. He stated that this year’s honorees are role models that have dedicated their lives to the pursuit of justice. Back in 2013, Elena Milashina, a Russian human rights activist and investigative reporter with the independent newspaper Novaya Gazeta, received the same award.